Since time immemorial humans have been singing to express their feelings, gratitude, and love towards fellow beings and nature. Singing helps in inducing a sense of harmony and bliss in this fast-paced life, where quality time and leisure have become distant dreams. 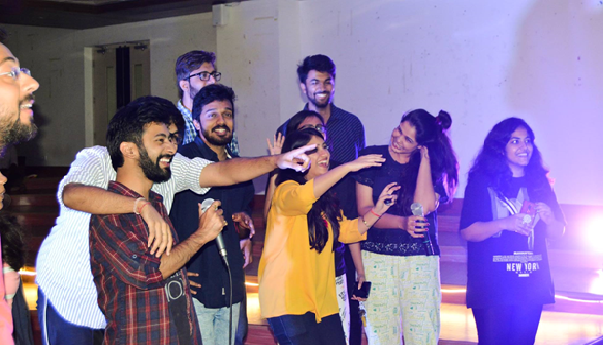 The Music Club of IFMR GSB “Raga”- one of the most loved clubs provided a much-needed detour to the students when they organised a karaoke night in the campus. The event saw over-whelming participation from both first years and second years. The event was a blessing in disguise as the entire week was jam-packed with assignments, surprise quizzes, submissions, and deadlines. Students participated with much pomp and show. They basically had to sing songs of their choice along with the Karaoke. As the night progressed the house was made open to the audience. It was a free-flowing heart-warming session as many students from the audience turned up and sang their hearts out. The event was marked with light snacks and drinks which kept the audience rooting for more. It was a success and students went back with memories they would cherish for a long time to come.